It’s all tricks and no treats according to Len McCluskey, as Labour’s affiliates respond to the budget announcements made by the Chancellor yesterday. The many actions being taken to save and defend jobs in workplaces across the country go to show that the end of austerity has not arrived. In my last piece, I wrote about the planned closure of Post Offices, due to be privatised and relocated to WHSmith stores in communities nation-wide. Since then, the CWU has launched a major campaign to Save Our Post Office, and the 800 jobs they say are now at risk. It kicks off with the launch of a new website, www.saveourpostoffice.co.uk, a call for members of the public to contact their MP, and a promise to organise campaign activities all over the country in the run-up to Christmas. Meanwhile, the CWU’s members in the Post Office are currently voting on an offer of a 5.3% two-year pay rise with a recommended ‘Yes’ vote. Today, Unite and GMB members at the Appledore shipyard in Devon will present a petition against the threatened closure, which could cost 200 jobs. Over the weekend, hundreds of workers and locals turned out at a rally in support of the campaign to keep the 163-year-old workplace open. The weekend also saw some shining examples of grassroots football and the union movement working together, as local Bideford Football Club dedicated their game to the Save Appledord Shipyard campaign. Meanwhile, Community has become the prime sponsor of an under-7s football team in the West Midlands, who seem delighted with their new kit. The young footballers aren’t the only ones striking in the name of Community, either. Members of the union at a leather tannery in Paisley, Scotland, have been on strike over pay. Despite a deal from the Leather Producers Association being unanimously rejected by workers, the company imposed it anyway, prompting the walk-out. 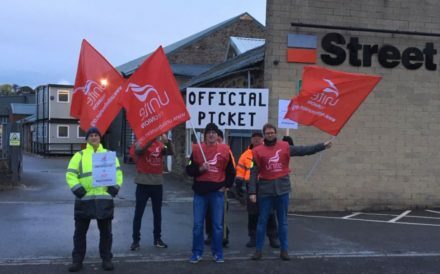 A 24-hour strike began on Wednesday 17th October, and has been followed by an indefinite work to rule and overtime ban. More reasons to hate and oppose the anti-democratic Trade Union Act: Unison’s ballot of its members in higher education didn’t meet the turnout threshold, despite being overwhelmingly in favour of strike action. Unite’s own universities ballot is yet to finish. A strike by Unison members in health in Bolton, however, has successfully forced a subsidiary company to shell out the equivalent of a new NHS pay offer. Following last week’s inspiring action by both Unison and GMB members in Glasgow – overwhelmingly low-paid women fighting for equal pay – talks with the council have now reopened, the union says. A shocking follow-on from the strike however, was an antisemitic online attack against Rhea Wolfson, a GMB organiser involved in the dispute. It’s crucial the movement unites behind her, a prominent Jewish Labour movement activist, in the face of such vile abuse. The union is pushing for an intervention from the Scottish government in response. It’s all kicking off at ScotRail. Three unions currently have Abellio in the firing line, as Unite’s engineering members have voted by 97% for a strike ballot in a dispute over working conditions. Transport union TSSA has called for Abellio to have the railways franchised removed, following news that ScotRail will be fined £2m for failing passengers, while ASLEF has also issued fresh calls for renationalisation following the news. The remaining stages of the Offensive Weapons Bill, a proposal that would restrict the sale of knives and acid, was last week delayed by government. That gives USDAW more time to rally support for their call for the bill to accommodate protections for shopworkers preventing sales. The union is asking supporters to write to their MP, calling on them to support the amendment that would make it an offence to assault, threaten or abuse a worker refusing an illegal sale. You can support the call by writing to your MP here. USDAW has also this week launched a fresh demand for recognition at Debenhams, following the announcement that the department store plans to close 50 stores. In response to the Autumn Budget, USDAW has published a new industrial strategy aimed at curbing the crisis in our high streets. The Musicians’ Union have been championing Tracy Brabin MP’s 10-minute-rule bill on shared parental leave for self-employed parents. The bill failed to progress passed its second reading, but could well return. If you’re a festival fan or a budding musician, you might also be interested in the new BBC Introducing festival, taking place 8-10th November, where the Musicians’ Union will be hosting a takeover, dubbed “Don’t Let the Bastards Grind you Down”. Finally, this week Labour affiliate unions have been lining up behind candidates in the Welsh Labour leadership election. So far, Unite, ASLEF, NUM, CWU, BFAWU and Unison have nominated Mark Drakeford, while GMB and Community have given their support to Vaughan Gething. The third candidate, Eluned Morgan, is yet to receive a trade union nomination. Given the nature of the electoral system in this selection, trade union members account for a majority of the electorate – an appeal to them will likely be key in deciding the winner.